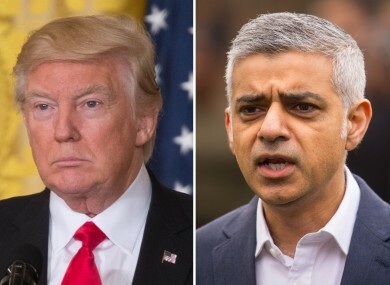 DONALD TRUMP HAS lashed out at London’s mayor Sadiq Khan, accusing him of downplaying the threat of terrorism a day after knife-wielding men mowed down and stabbed revelers in the British capital. Trump said the attack showed it was time to “stop being politically correct and get down to the business of security for our people,” after tweeting the night before – as the scenes of panic in London were still unfolding – that it underscored the need for his contested “travel ban” on several Muslim-majority nations. My message to Londoners and visitors to our great city is to be calm and vigilant today. You will see an increased police presence today, including armed officers and uniformed officers. There is no reason to be alarmed by this. The attack in central London came just weeks after a suicide bombing at a concert in Manchester left 22 dead, and it recalled an attack in March when a man drove a car into pedestrians near the seat of Parliament, killing five. It was not the first time Trump has been accused of using a terror attack to make a political point, and with Londoners still in shock today, the president’s tweets drew angry responses on both sides of the Atlantic. Email “Outrage as Trump targets London mayor over attacks”. Feedback on “Outrage as Trump targets London mayor over attacks”.